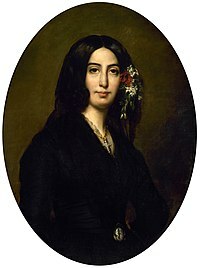 George Sand was born Amandine Aaurore Lucile Dedvant in Paris, France in 1804. Today is the 208th anniversary of her Birth. Sand wrote at night, every night, from midnight to sunrise. Her novels, which are romanic idealism in nature, include Indiana, Valentine, Lelia, Le Compagnon du tour de France, La Mare au diable, Consuelo, La Petite Fadette, and Le Peche de Monsieur Antoine. She wore men’s clothing in public, had affairs (most notably with Polish pianist and composer Frederic Chopin), smoked tobacco, and was considered a loose woman by some people in society. Yet she was admired for her spirit and frankness by countless others. This entry was posted on Sunday, July 1st, 2012 at 5:40 pm	and tagged with George Sand and posted in postaday, Thought of the Day, Today's Birthday, Writing. You can follow any responses to this entry through the RSS 2.0 feed.